If you’re having a hard time feeling the spirit of the holidays this year, or, you’re not and can’t get enough of it, head to one of these three charming towns, where they do Christmas right: Merano in South Tyrol, Manarola in the Cinque Terre and Gubbio in the central region of Umbria. From colorful and joyous Christmas markets to one-of-a-kind nativity scenes, you’ll surely be entertained - and hopefully feel a bit of Christmas magic. At the entrance to the Passiria Valley, in the northern region of South Tyrol, stands Merano, surrounded by mountains rising up to 3,335 meters. Thanks to its microclimate, which makes for mild winters with sunny days, Merano can be enjoyed even in the coldest months. 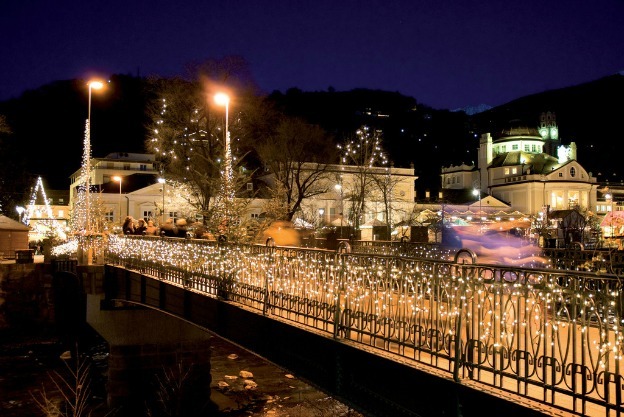 Merano is the site of one of the region’s most popular Christmas markets (opening November 27 this year). Thousands of visitors flock to the central Piazza della Rena, where colorful wooden stands display artisanal products and Christmas decorations for the home, along with traditional local delicacies (e.g. ginger cookies, baked cinnamon apples); enjoy tastings of vin brulé and Christmas tea, made with orange peel and clove, as well as chorus and music performances, in a relaxed atmosphere. Stalls can also be found along the river Passirio and in Piazza delle Terme. The entire town is adorned to make you feel the holiday spirit: walk down elegant Via dei Portici, Merano’s main street connecting Piazza Duomo with Piazza del Grano, decorated with Christmas festoons and decorations, and peek inside the polished stores and cafés, where you can stop for a slice of delicious apple strudel cake. Visit the Duomo, dedicated to Saint Nicholas, which in December displays a beautiful nativity scene. If at some point you wish to get away from the crowds hanging around the Christmas market (yes, it will be crowded), take a walk along the banks of the Passirio river, surrounded by trees and water, on the same trails walked by Sissi, Empress of Austria, who was one of Merano’s most fervent admirers - she used to spend long winters here attracted by the town’s mild climate. Top it all off at the famous Terme, the spa resort of Merano, which offers as many as 15 pools and a large variety of treatments. 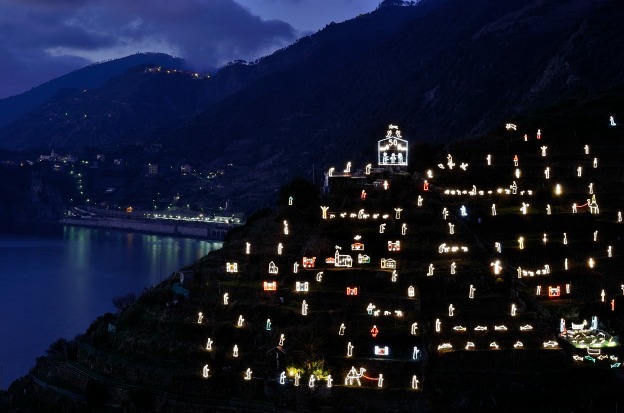 Since 1963, this tiny borgo in the Cinque Terre hosts a grand representation of the Nativity Scene: an entire hill, Colle delle Tre Croci, gets populated with 300 figures – characters from the story of the Nativity, shepherds, animals, angels, houses – lit by thousands of light bulbs. The nativity scene, which extends for 4,000 square meters, is built on the former terraced vineyards. This nativity scene is the loving work of Mario Andreoli, a retired railroad worker who, every year, enriches his creation with new figures and characters, all made with salvaged material. In 2007, his nativity scene entered the Guinness World Record. It is inaugurated every year on December 8, when hundreds of people carrying torches walk toward the hill. Every day until early February, the presepe is illuminated at dusk. The 15,000 light bulbs are powered by a photovoltaic system, making it an environmental-friendly affair, in the spirit of sustainability that is part of the philosophy of the Cinque Terre and its National Park. A good vantage point to admire the spectacular nativity scene is the square in front of the Church of San Lorenzo. Perched on a rocky promontory by the sea, Manarola is, after Corniglia, the smallest of the five villages making up the Cinque Terre. The borgo has very ancient origins; it is thought to be the oldest of the towns in the Cinque Terre, with the cornerstone of the church, San Lorenzo, dating from 1338. Manarola displays the typical architecture of the tall case-torri (tower-houses) of Genoa, and is surrounded by mountains closing in on a tiny port. Imagine it all lit with the Christmas lights: a sight not to be missed. 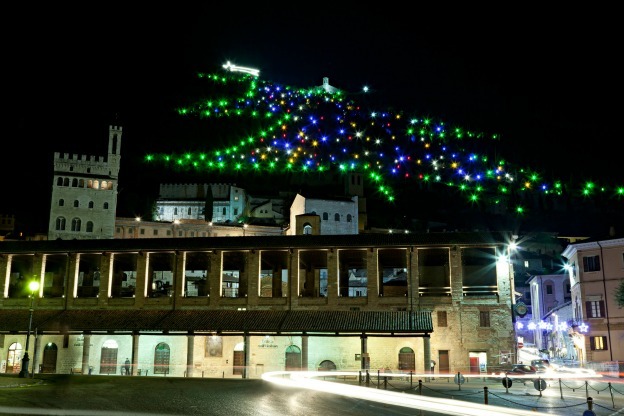 During the holidays, Gubbio becomes a village full of light. Warmly illuminated streets, decorations and festoons, the nativity scene in the old neighborhood of San Martino, and the world’s largest Christmas tree all contribute to make Gubbio even more magical during the holiday season. Head to Piazza Grande, or stroll along the picturesque streets, full of artisans’ workshops and stores selling traditional handicrafts. The biggest show is in the ancient neighborhood of San Martino, which transforms into a big nativity scene with real-life statues (165 cm and above) representing ancient trades, scattered along medieval alleys, among arches, doors, gates and small squares. The locals call it Via del Presepe, and they are the ones responsible for this initiative, which began 13 years ago, when they decided it would be nicer to have a large, open-air presepe, rather than many individual ones inside the homes. The clothes worn by the statues are sewn by the local women who start working on them in September. A unique touch is provided by the notes posted on the doors of the neighborhood’s houses with sentences from the Bible and the Gospel, inviting passersby to reflect on the spirit of the holiday season. Plus, Gubbio boasts the largest Christmas tree in the world, located on the slopes of the 2,950-foot-high Mount Ingino, which overlooks the town. More than 250 bright-green lights form the silhouette of a fir tree. It is the work of a group of local volunteers, who began the tradition in 1981. It entered ‘The Guinness Book of Records’ in 1991 as ‘The Largest Christmas Tree of the World’. The tree is 650 meters tall and 349 meters wide at the base. It takes 35 kilowatts of electric power and 8,500 meters of electric cables to illuminate the tree via a photovoltaic system. This year, it will be lit on December 7.